I've noticed it takes my eyes a few minutes to adjust when walking outside into the dark but my dog can run out and she seems to see everything as if it was daylight. Is this because they can only see black and white or something else? Chris - You've got two important questions there. First of all, getting used to the dark: We'll have to think John Gamel for this, who is an ophthalmologist over in America and he sent me some ideas. One of the most important points with eyes getting used to the dark is actually how your eyes see in the first place. When that you're looking at something, there are rays of light of certain wavelengths - or colours - coming into your eye and they interact with the photopigment. This is a chemical in the retina and is sensitive to certain wavelengths. When the light waves hit that pigment, they cause the pigment to change its configuration, causing it to "bleach". When it changes its configuration, it then signals the cell to change its behaviour so that's basically how the retina turns light waves into brain waves. It's turning the information into pulses of nerve activity the brain can understand. For a period of time, when that pigment has been bleached, it can't to respond to light again until its regenerated; that is, until its shape goes back to its original starting confirmation. So, when you go from a very light area, where, on average, many of your pigment molecules in your retina will be being bleached at any given time, and then you go into the dark, many of those bleached pigment molecules will slowly turn back into unbleached pigment molecules. This renders them sensitive again. So, in other words, the longer you spend in the dark, the more pigment molecules becomes sensitive and therefore, the more sensitive your eyes become. That's the first point. The second point is that the retina is a very dynamic electrical organ. There are two different ways in which the retina responds to light. There are cone cells, which are not very sensitive to light. They need a lot of light to activate them, but they see in colour. Then there are rod cells, which are very sensitive to light but they can only see in black and white. What the eye can do is, at low light conditions, you can connect - via an electrical coupling called a gap junction - some rod cells to the cone cells. What this means is that the rod cells trigger the cones at a lower amount of light than they otherwise would need to turn them on. As a result, you can actually see in colour at much lower light than you would otherwise. It takes a little while for these gap junction connections between the different classes of rods and cones to actually get activated. So, there's also that process of adaptation. Now, in terms of what happens when your dog goes out into the dark: the reason dogs can see so well at night is because, in common with many animals that are nocturnally active, dogs have a structure at the back of their eye called a tapetum lucidum, which is Latin for bright carpet. If you look at the back of the dog's eye - also sheep have this, cows have this, horses have this - the back of the eye is very, very reflective and shiny. 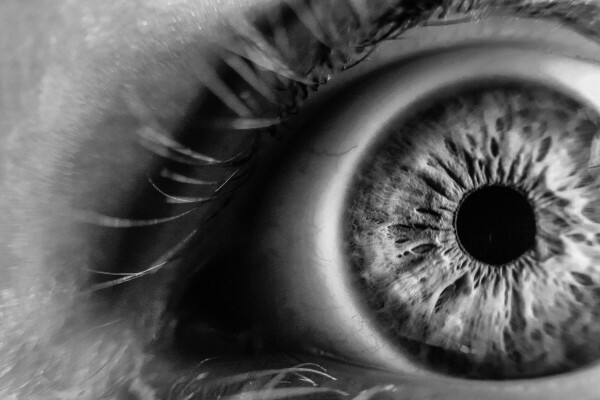 This means that any light that comes into the eye but misses the retina the first time can bounce off the back of the eye and back on to the retina. The benefit then is that it makes the eye much more sensitive to light, but slightly less able to pinpoint precisely where the light is coming from. So, there's a small loss of acuity which comes at the cost of increased sensitivity. So, that's basically how your dog can see much better in the dark than you can. Dave - So, is this tapetum lucidum the reason why if you try to light the dog's eyes they bright up so brightly? Chris - When you shine light into a person - and you see this when you do flash photography and you see red eye - the human retina looks red to the camera because the light illuminates the very dense rich blood supply at the back of the eye, because the retina has one of the highest metabolic rates of all the tissues in the whole body. But, in the dog or one these other animals, because the back of the eye has this tapetum lucidum - this bright carpet - the light that goes into the eye immediately turns around and bounces straight back out again in that very demonic way. It's because it's light reflecting off the back of the eye that makes your dog's eyes look very bright. But the same thing doesn't happen with the human. Previous How can I boil water without killing the fish that lives in it? Next What is the ultimate fate of a star?